Margaret Axson Wilson gives Jessie Wilson Sayre a brief account of recent events. I didn't write to you yesterday because Christie was here. I have so enjoyed having her here, and have renewed my love for her. She is a dear, a bit unbalanced to be sure, but perfectly sincere in everything. I certainly hope Halsey wins out in this deal, for he is a dear too. The poor child, she is not playing with the two for fun, she really doesn't know which she likes best. Last night after Halsey had been here a long time, she was inclined to decide for him, I hope she'll not change. Yesterday Clarke Mather and Halsey and I and Christie went walking. I enjoyed it very much, Mr Mather is very interesting, and most easy to talk to, in fact does most of the talking himself. Then we came home, and I made tea for them, and Halsey stayed for supper. He told Mary that he certainly was going to brave the accusations of boot-licking and come over here to see me after she hads gone. I had simply piles of fun at the Campus club dance on Friday night. They were a jolly crowd of men. My man, Mr Wood was so jolly and funny and nice. On the whole they were not as genteel as the Elm club men, nor so interesting, but my I did enjoy the dance. I am simply inordinately fond of dancing now. Wasn't the game unsatisfactory. Every-one expected us to winIt was dreadfully exciting, I felt simply exhausted after it, almost as blue as if we had lost. You never saw such a crush at a game in your life. There were 30 thousand tickets sold. Mother and I felt as if we would have some ribs broken or something, when we tried to get up into the aisle, leading to our seat. The trouble was the same as two years ago, the slippery ground. You are lcoming home for thanksgiving, aren't you dearie? I will go back with you to Baltimore for that Monday will be my lesson day. I wish you were coming up with Mary White too. Cousin Mary will spend next Sunday with us. Did I ever tell you that ElPurves is teaching up at Briar Cliff in the Hudson? Mildred has been taking care of her mother, but now Mrs Purves is in the hospital in Phila, to stay for some time. Georgia is staying with Rebecca, and Mildred and Gertrude are boarding in town, and Mildred is having the time of her life. Mother is so proud of you for having got through your exams! I hope the conference went off well, and that you are not worn out by it. I do hope you will have a peaceful two weeks now before rushing begins. Christie seems to be quite hopeful about Elizabeth Eer and Hazlehurst. Wouldn't it be fine if we got them? Well dear, I can't think of any other news to tell you and, as I am tired I must stop and rest before Mrs Harris's tea this afternoon. Love to all the dear girls, and to your darling self. 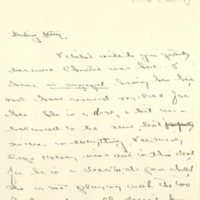 Wilson, Margaret Woodrow, 1886-1944, “Margaret Woodrow Wilson to Jessie Woodrow Wilson Sayre,” 1906 November 19, WWP17357, Jessie Wilson Sayre Correspondence, Woodrow Wilson Presidential Library & Museum, Staunton, Virginia.